Built with a distinctively tailored aesthetic, the Victoria, Victoria Beckham sleeveless jumpsuit hails from the designer's companion line and is crafted from a luxurious virgin wool-blend to form a subtly androgynous, power-dressing piece. Cut with contrast satin lapels and a double-breasted front, the sleeveless jumpsuit nips in at the waist and continues through the leg with a relaxed, straight fit. 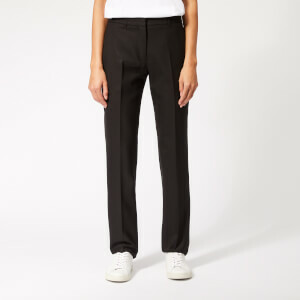 A take on men's tailoring, the jumpsuit features a welt pocket at the chest, belt loops and centre pleats down the legs. Finished with two side seam pockets and two rear welt pockets. Concealed zip fastening to the left side. Main: 62% Virgin Wool, 33% Polyamide, 3% Elastane. Contrast: 64% Polyester, 36% Viscose. Lining: 100% Viscose.